Our O.A.T. Blend goal is to help keep life simple and healthy. Our recipes will reflect that. We focus on using the least amount of ingredients, while still creating a satisfying 'real food' snack. Quick and Healthy - your family will never suspect!! You can always ADD IN your favorites for extra variety and nutrition. Or, try our O.A.T. 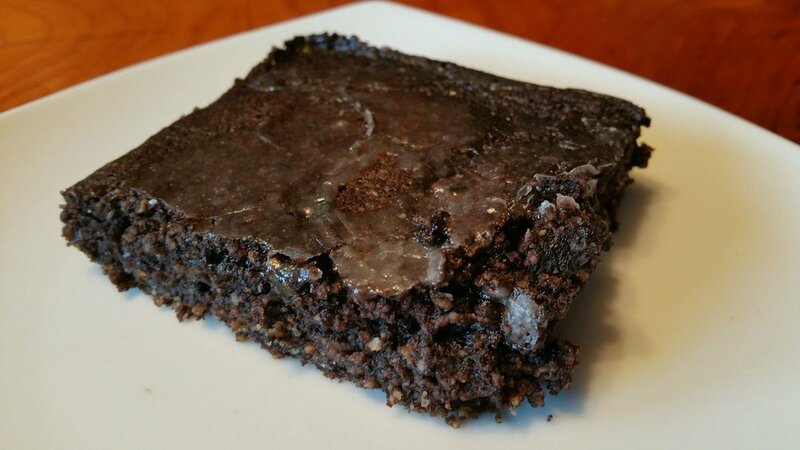 Blend as a substitute for the 'flour, sugar, and leavening agents' in your favorite recipes! NOTE: For liquid, I use Unsweetened Plain or Vanilla Flavored Almond Milk or just water. For the Oil, I use Macadamia Nut Oil, feel free to use whatever kind you like the taste of, and/or use fresh Apples peeled and blended or even Butter. Coat a Donut Pan with cooking spray. Add 4 T. of batter to fill each donut mold. Shake pan to level batter. Bake at 350 for 12 - 15 min. Let cool in pan for 5 minutes. Release donuts onto cooling rack. Prepare glaze: 1 T Apple Cider, 1/3 C Powdered Sugar, Cinnamon to taste. Stir well. Drizzle over cooled donuts. DIRECTIONS: Preheat oven to 350° with rack in center of oven. In a Blender, liquefy 1 Banana, 1 Egg (small), and 2 T. liquid for 1 minute. Add 1 T. of chopped Walnuts, 2 T. re-hydrated dried Cranberries, together with the blended ingredients to O.A.T. Blend. Fold all ingredients gently together. Scoop batter evenly into 6 coated muffin papers or well coated muffin pan. 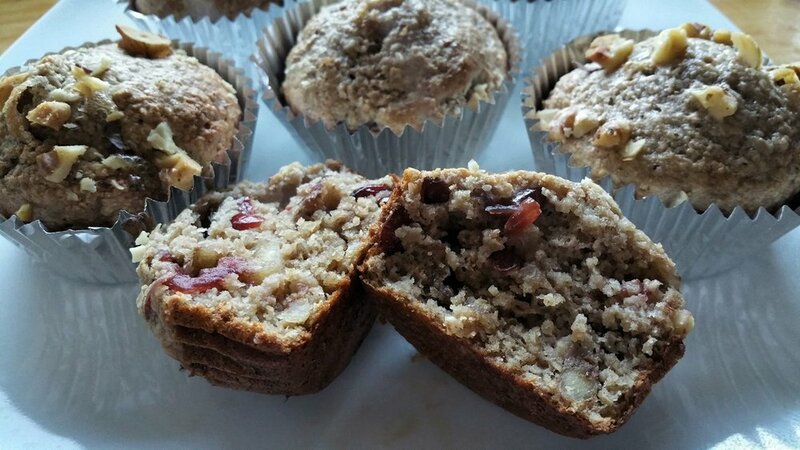 Top each muffin with 1 T. chopped Walnuts, and sprinkle with Cinnamon Sugar. Bake in a preheated oven for about 15 minutes; the muffins will spring back when lightly touched or an inserted toothpick will come out clean. For O.A.T. Banana Bread – Double the recipe, and pour into a small (8” x 3” x 2”) sized loaf pan. Bake for 40 minutes, or until toothpick comes out clean. Let cool completely and slice with a serrated knife. In a Blender, liquefy 1 Egg (small), and 2 T. liquid for 1 minute. Add 1 C of shredded Zucchini, and 1 T. of chopped Pecans, together with the blended ingredients, to the O.A.T. Blend. Fold all ingredients gently together so all dry batter is gone. Scoop batter evenly into 6 coated muffin papers or well coated muffin pan. Top each muffin with 1 T. chopped Pecans, and sprinkle with Cinnamon Sugar. For O.A.T. Zucchini Nut Bread - Double the recipe (may need to add 1 additional Tablespoon of liquid), and pour into a small (8” x 3” x 2”) sized loaf pan. Double the recipe for muffins, (omitting the nuts and replacing the 2 T. of Oil with 1 T. of Oil, 1 T. of Lemon juice/zest and 2 T. of unsweetened Vanilla flavored Almond Milk). Fold gently together and pour into a small (8” x 3” x 2”) sized loaf pan. Bake for 30 - 40 minutes, or until toothpick comes out clean. Let cool completely. Cover with a Lemon Glaze. (Wisk 2-3 T. Lemon Juice with Powdered Sugar to taste). Preheat oven to 375 degrees F (190 degrees C). Lightly butter a baking dish. Place 4 C. Blueberries in large bowl. Pour in 1 T. lemon juice; sprinkle 1/4 C. sugar evenly over berries. Gently stir to combine. Transfer to prepared baking dish. Gently pat down berries with the back of a spoon and level the surface. Place 1/2 C. rolled oats, ½ C. O.A.T. Blend in a bowl. Mix together with 1/4 C. Softened butter with a fork until mixture is blended and crumbly, about 1 minute. Distribute crisp mixture over the top of the berries and smooth out with a tip of a fork so all berries are covered. Bake in preheated oven until dark and berries are bubbling, about 45 minutes. Allow crisp to cool somewhat and firm up. Serve warm. 4 T. Butter - Melt in a 1 1/2 Q baking dish. Mix 1 1/4 C. O.A.T. Blend with 3/4 C. Milk. Pour evenly into baking dish to cover melted butter. Mix 2 C. Fresh Maine Wild Blueberries with 1/2 C. Sugar and 1/3 C. water. Spoon berries evenly over batter. DO NOT STIR. Sprinkle top with Sugar. In a large bowl, add blueberries and peaches. Add 1 tablespoon tapioca starch and 2 tablespoons sugar; toss until the fruit is evenly coated. Place in a cast-iron pan or glass baking dish. Measure O.A.T. Blend in a medium bowl. In a small bowl, add coconut oil, almond milk, vanilla extract. Whisk to combine. Slowly pour into the O.A.T. Blend; stir until a soft dough forms. Drop the dough by spoonfuls evenly across the top of the fruit. Bake for 35-40 minutes, until the top is golden brown and crispy on the edges. Serve with a scoop of vegan ice cream! Preheat oven to 375 degrees with racks in middle and bottom. Stir together 2 C. berries, 1/4 C. sugar, 1 T. cornstarch, 1 T. lemon juice. Transfer to a 2 1/2-quart baking dish. Cut in 3 T. cold butter, until the largest pieces are the size of small peas, into 1 C. O.A.T. Blend. Add 6 T. Milk, and use a fork to incorporate, stirring until a soft sticky dough forms. Dollop dough over filling, dividing evenly. Sprinkle with sugar. Bake until biscuits are golden brown and filling is bubbling in the center, about 45 Minutes. Cool at least 1 hour before serving. Serve warm or room temperature with a scoop of ice cream or Greek Yogurt. Preheat oven to 350 degrees F. Lightly grease an 8” x 8” pan. Mix 1 1/2 C. O.A.T. Blend and 3 tablespoons Dark Cocoa Powder together until thoroughly blended. Make 2 small holes in the mixture. Pour 1 T. White Vinegar in one hole, and the 3 T. Oil in the other hole. Pour 1 C. Unsweetened Vanilla Almond Milk over the top. With a fork, mix all together. Pour into a prepared pan and sprinkle with fine sugar. Bake for 25 to 30 minutes, or until a toothpick come out clean. Cool completely on rack. Dust with Powdered sugar, and serve with fresh berries on the side. Enjoy! Optional: Vanilla Glaze - Prepare glaze by adding 2t. of Unsweetened Vanilla Almond Milk to 3 T. of Powdered Sugar. Wisk until thoroughly blended, and pour evenly over cake. Let cool completely before slicing and serving. Mix 1 1/2 C. O.A.T. Blend and 3 tablespoons Sweetened Coconut together until thoroughly blended. Pour 1 T. White Vinegar in one hole, and the 3 T. Coconut Oil in the other hole. Pour 1 C. Unsweetened Vanilla Coconut, or Almond, Milk over the top. With a fork, mix all together. Pour into a prepared pan and sprinkle with sweetened Coconut. Bake for 25 to 30 minutes, or until a toothpick come out clean. Cool completely on rack. Serve with fresh berries or preserves on the side, and enjoy! NOTE: To take the "Wacky" out of the the recipes above, replace the White Vinegar with a Large Egg (whisked)! 1. Preheat oven to 350 degrees F. Lightly butter a 9" round baking dish. 2. In a blender, add 14 ounces of Coconut Milk, 3 Large Eggs, 4 T. Melted Butter. Blend on high until thoroughly mixed. 3. Add 2 Cups of O.A.T. Blend to wet ingredients in blender. Pulse until thoroughly mixed. 4. Fold in 1/3 C. Unsweetened Coconut to wet mixture. Pour into prepared pan. Sprinkle top with 2 T. shredded Unsweetened Coconut, and 1/8 C. chopped Cashews. Top all with a sprinkle of Cinnamon Sugar (If desired). Bake for 25 to 30 minutes, or until toothpick comes out clean. Let cool in pan, on wire rack, for 20 minutes. Slice and enjoy at room temperature, or refrigerate and serve cold. Blend together: 1/2 C. unsweetened Vanilla Almond Milk, with either 2 T. Oil or 1 Egg (for more cake like), and 1/4 C. Peanut Butter. Fold in 10 oz. O.A.T. Blend. Once all ingredients are combined, spread evenly into a parchment paper lined 9"x9" greased pan. Bake for 12 - 15 min. at 350 degrees. Check with toothpick. remove from oven and sprinkle with mini chocolate chips. When melted, spread gently to cover. Sprinkle with crushed peanuts. When cooled, if chocolate is sticky, you can put in refrigerator until it hardens. Cut into bars. ENJOY! With a delicious citrus glaze. The perfect summer dessert. Add liquid to 1 ½ C. O.A.T. Blend. Fold together until all dry ingredients are wet. (Batter will be very runny). Pour immediately into prepared pan. Bake for 12 minutes, or until a toothpick comes out clean. Remove from oven and let cool 10-15 minutes. Prepare glaze by adding 1T. each, of fresh Lemon and Lime juice to 3 T. of Powdered Sugar. Add Lemon and Lime Zest. Wisk until thoroughly blended, and pour evenly over cake. Let cool completely before slicing and serving. Enjoy! Optional: Fold in Fresh Blueberries or Cranberries to dry batter, before baking. Preheat oven to 350 degrees F. Lightly grease a Cookie sheet, or use a Silicon Mat. Mix 1 C. O.A.T. Blend and 1/2 t. of finely crushed Organic Lavender together until thoroughly blended. Add 3 t. Oil (Macadamia recommended), 2 t. of fresh squeezed Lemon juice. With a fork, mix all together. Place Tablespoon sized balls from your batter onto silicon mat and sprinkle them with prepared Lavender Sugar (see recipe below). Bake for 8 to 10 minutes, or until golden brown. Cool completely on rack. Serve with fresh berries or preserves on the side, (and a nice cup of tea of course), and enjoy! Lavender Sugar: In a BLENDER, Blend 1 T. Lavender buds with 2 C. of Sugar. Store in an air tight container. Measure 5 oz. liquid (~3/4 C) (milk/substitute, or water). Add 5 oz. O.A.T. Blend (1 C), and fold in gently. Batter will be runny. Thoroughly grease your waffle iron, and pour batter evenly to cover. Let cook until dark golden brown (3 + minutes). Carefully remove to a wire rack, and enjoy immediately! Makes 2 Waffles depending on the size of your waffle iron. For traditional cake-like Waffles, add 4 oz. of liquid (Egg, milk substitute, milk, oil, and/or water). Fruit (Apple or Banana to replace liquid), Nuts, Flax, Chia, and/or Hemp Seeds. Re-hydrated Berries can also be folded into batter. WE ARE TESTING MORE RECIPES, AND WOULD LOVE ANY THAT YOU HAVE MADE WITH SUCCESS!